THE GREAT LAND, SEA, & AIR BOOK TOUR was a SMASH HIT! From the United States centennial to World War I, the Reade family members were among the best known figures in America. Not surprisingly, three generations of inventor/adventurers named Frank led to some confusion as to who was who. Frank Reade Jr. was the most prolific member of his family. His specialty was aeronautics. He developed unique helicopter airships that inspired both Jules Verne and Igor Sikorsky. Frank Reade and Frank Reade Jr. each built steam men. As some of the world’s first robots, their significance cannot be overestimated. 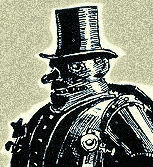 After the success of the steam men, a new generation of robots was constructed.